Four years ago, the first ever Johnson Elementary School Color Jam – or Fun Run – was held at the Bridgeport Recreation Complex. The goal was to create a unique experience and to raise funds for the school through the PTA. Four years later, it’s safe to say it’s worked. Organizers have set the fourth annual Johnson Color Jam and this year it’s running a little bit l ater and with a theme. The 5K event will take place on May 4 at the Bridgeport Recreation Complex. Thanks to the date, the theme will be “May the 4th Be with You,” which is Star Wars theme, Marjorie Toohey, Johnson PTA Vice President and committee chair for the color jam. “We’re really encouraging people to come out and participate in their Star Wars outfits or have something from the series,” said Toohey. Toohey confirmed recently that Star Wars re-enactors will be on hand for photos and fun. For those wanting to race, the event will begin at 9 a.m. Registration kicks off at 7 a.m. for those not pre-registered. The race will be unique for more than just the Star Wars theme. 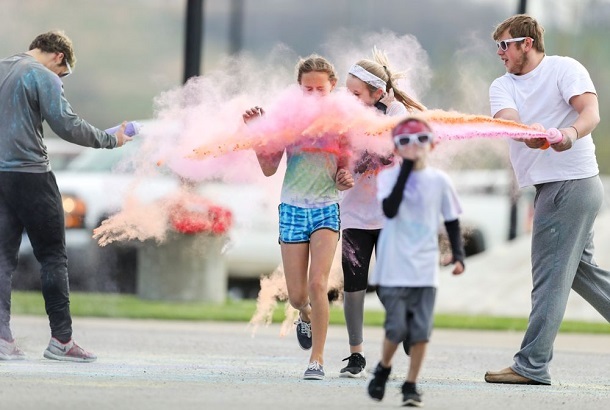 It’s, again, a color run, which means those taking part will be showered with multi-colored handfuls or cornstarch coming from a variety of areas. The event is popular with sports enthusiasts looking for a run and youngsters and family members looking for fun. Although there are several throughout the state and country, Toohey said she’s still pretty sure it’s the only color run in Harrison County. She’s definitely sure of the impact it has on the PTA. “It’s one of our biggest fundraisers, but it’s also to promote community, promote physical fitness and to promote fellowship and family,” she said. “We want all ages to come out and have fun in an event that allows the PTA to assist our students in having an even better educational experience. For those pre-registering this year, they will receive a race day t-shirt, a bandana and sunglasses to wear in the event they’re concerned about getting the colored cornstarch thrown at the runner in their eyes or breathing it in. Individuals not registering prior to race day can bring their own glasses and bandanas. The field has become a large one in its short existence. Despite bad weather the last two years, and extremely poor conditions last year, 220 participants were involved. The first race in 2016 drew roughly 100 participants. “We certainly want people to pre-register, but we encourage those who don’t to come out. We had 30 show up and sign up last year even with the poor conditions,” said Toohey. The cost to participate is $25 for those 12 or older. Individuals ages 4 through 11 will pay $15 and if anyone under the age of 4 participates it is free. The free registration does not include the items given to the paid individuals registering. “Anyone can take part; it’s not limited to individuals from Johnson Elementary and Bridgeport. We’ve had participants from Pennsylvania and Maryland and would like to see another big turnout,” said Toohey. The 5K race is a flat course around the Bridgeport Recreation Complex. Toohey said participants will go around the course three times. Individuals should not be concerned about ongoing work on the indoor facility as she said there is plenty of parking and activities will also be completed before baseball activities begin later in the day. Toohey said the group is also looking for event sponsors. She said you can visit their Facebook Page, “Johnson Color Jam,” or call her at 443-254-3158. Individuals and businesses can also donate door prizes as tickets are drawn during the race to give out prizes to the field. Although not billed as a competitive race as individuals can walk, run, jog at any pace, timing will likely take place this year. Toohey said many individuals track their times so adding that element is a new feature for 2019 as well. Editor's Note: Photos from last year's event by www.benqueenphotography.com.